Following several weeks of very wet weather in December and early January, the River Tay has fortunately now settled back to a more fishable height. With one day to go before the new season opens, the river is now running clear and well within its banks. Should there be no significant rain overnight (snow is forecast inland which will be okay), prospects for Opening Day will not be bad, though slightly higher than ideal. As you can read below, 2013 saw an excellent spring on the River Tay, with the best catches reported between January and May since 1980. Hopes are obviously high that something similar might be repeated in 2014. So, are their grounds for optimism? Certainly, it has been the case that we have seen better numbers of spring salmon in a few recent years. This has been particularly true for larger 3SW and even a few 4SW fish, which have consistently been more abundant since 2008. Given the strong numbers of 2SW fish in 2013 as well as 3SW fish, it is hoped this might translate into an even better run of 3SW fish in 2014. 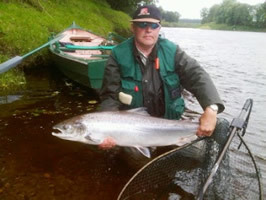 As 3SW fish tend to enter the river earliest in the year (January - April especially), it is hoped that the earliest part of the Tay season might be particularly good. That will of course, also depend on the weather also playing its part. Tight lines and best wishes for 2014. The River Tay's spring season in 2013 was the most remarkable in many years. For example, at least 21 salmon were caught on Opening Day 2013, which made it the best in a long time, certainly since the 1990s. While returns are still awaited from some beats, 171 salmon have been officially reported for February, making it the best February since 1995. March (457) was the best since 2006 and then 1990. April was also the best since 2006 and May was the best ever since reporting started in 1952. June was in fact the second best ever, following 2012's excellent June. In total 2599 salmon have so far been reported to end May, which makes it the best spring overall since 1980! There were several causes of the good catches in spring 2013. One was weather. The long cold dry spring did help by slowing down and delaying the upstream migration, in effect making the fish easier to catch for some, but not all, of the time. However, that was not the only reason. Fish counters operated by SSE on the River Lochay (near Killin) and on the River Tummel at Pitlochry Dam proved there were genuinely more salmon in the river too. The Pitlochry count to the end of June was the highest since 1978 and that to the end of July not signifcantly bettered since 1979. (For more information on counts click here). FISHTAY AND FISHTAY'S FACEBOOK PAGE. Robert Russell releases his magnificent Upper Scone 28lber. 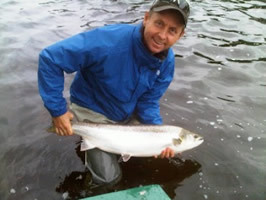 Bjorn Wicklund with a stunning 25lbs salmon from Islamouth. 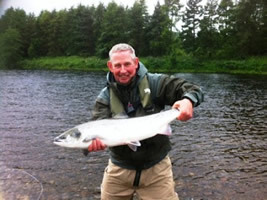 Tony Griffiths with a sea-liced 12lber from Kercock. Anders Hoen with his first Tay salmon. Calum McRoberts with a lovely 11lber from Newtyle.